I promised Laurence St. John, a fellow "Imajineer" and author of the Metatron series, a spot on this blog a while back and thank heavens he remembered because the summer ate my brain. At the age of 23 and after three years of dedication, hard work and sweat, in 1988, I received my first-degree black belt (Shodan) in Tae Kwon Do. This gave me the self-confidence and perseverance needed to surmount anything that came my way. That is why my main character, Tyler, is involved with martial arts. I have personal knowledge of Tae Kwon Do therefore it was fun creating a character with this great ability. Question to readers: Have you ever taken any type of martial arts class? If not, would you like too? While working in the steel industry, my place of employment changed hands for the third time. Fortunately I was able to retain my job. In the same year my first granddaughter Kendall was born. This was one of the most uplifting moments of my life. It was at this time when I became inspired as well as determined to write my penned-up thoughts on paper. A few years later, and many hours of writing, editing, revising and re-editing, it was finished. This journey had many bumps and curves in the road but at the end, it was all worth it. 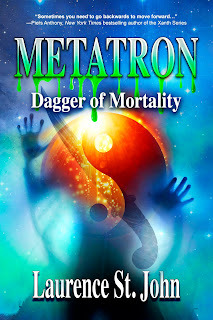 Get METATRON: The Mystical Blade for only $3.99! If you have a chance, I would be grateful if you could write a Customer Review. It should only take a few minutes of your time - Thank-you. Book 1 of the series is also available on Amazon. I took some martial arts and wanted to take more. I tried to talk my first boyfriend into giving me lessons. He was a black belt in Aikido. Later I took Wendo at university and I used to watch my son's karate lessons and practice his katas with him.